Every human being is a unique universe, but psychologists who have a keen eye for details keep discovering new behavioral patterns that are believed to be rooted in our childhood and can be applied to everyone. We decided to share these useful psychology tricks; maybe they will positively affect your communication skills and make your life easier in some way. 01: To find out if a person likes you, pick a word and every time he/she uses this word or synonymous word phrases, nod and smile. If he/she does like you, watch him/her start using the word all the time. 02: Do you want people to take your words seriously? Every time you tell them something, say that your father taught you this. People tend to believe parents’ advice inherently. 04: If you want people to agree with you, just nod while you’re talking. 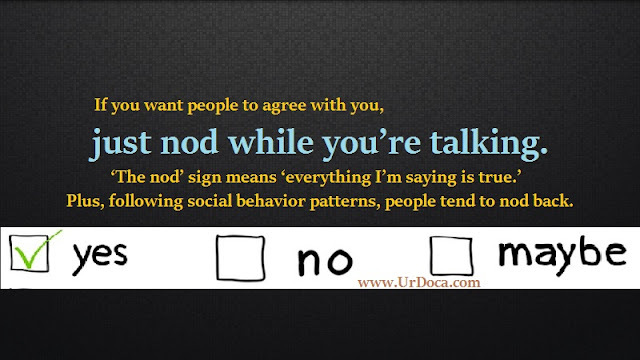 ‘The nod’ sign means ‘everything I’m saying is true.’ Plus, following social behavior patterns, people tend to nod back. 05: Have you ever wished the subway wasn’t that crowded in the morning?In crowded places look right in front of you, in the direction in which you’re going. You will be impressed watching the crowd literally give way to you. This trick is very easy to explain: in crowded places we tend to look other people in the eyes so that we know which direction someone is going. We take the opposite way so not to run into each other. 06: If a certain song is stuck in your head and you would love to forget it, try to think of the end of the song. According to the Zeigarnik effect, our brain tends to remember the things that we’ve left unfinished. So if you think of the end of the annoying earworm, you will be able to get it out of your head. 07: Want your kids to eat broccoli? Go ahead and ask them if they want two or five stalks of broccoli instead of asking them if they want broccoli. Thus, you’ve made your mind and chose broccoli for their lunch, but they feel like they have really made their own decision. You can use the same old trick in different situations. 08: If you have the feeling that someone is watching you, just yawn and look around. If someone is really stalking you, they will yawn too, since yawning is highly contagious. 09: Your friend will most likely help you carry, let’s say, a box of your stuff if you continue talking while handing over the box. The majority of people won’t even notice you’re handing them something and will take it. However, some people more attentive and less close to you may get pretty confused. 10: If you know you’re going to shake hands with someone, make sure your hands are warm enough. Warm hands promote a friendly atmosphere while cold handshaking will trigger the opposite effect. 11: Whatever your friend has just said, paraphrase it and say it again. The person who talks to you will subconsciously get the feeling you are a really great listener. Just don’t go too far with the paraphrasing thing. 12: If you want someone to help you, start your phrase with the words ‘I need your help…’ People hate feeling guilty and that’s why they won’t be able to refuse to help. 13: If you believe a person doesn’t like you, ask if you can borrow his pencil or pen. On one hand, people tend not to help those whom they don’t like, but on the other hand, it’s such a small favor that your ‘hater’ most likely won’t be able to say ‘No’. Eventually he will come to the conclusion that you’re not that bad. This post was republished from Brightside.me. You can find the original post here.